We are delighted to have been asked to take part in Red Ted Arts ‘31 Days of Love‘ series! 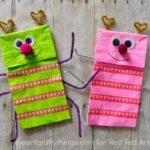 Red Ted Art is one of our most favourite blogs – always full of great crafts to try with the kiddies! 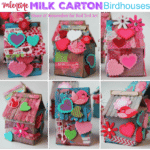 We simply adore heart crafts for kids. 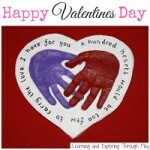 We enjoyed taking part last year too and created a Keepsake Footprint Salt Dough Heart! Be sure to check that out! You could also use the design on card fronts! So many of you LOVED the craft last year and it’s already being enjoyed lots this year too!! 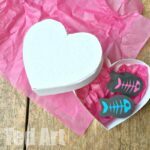 As an alternative we created a Hand Print Salt Dough Heart Keepsake too! I must introduce myself – Hello I am Amy! Living in the UK’s second largest city with my family I am completely addicted to chocolate biscuits, a good cupa and all things pretty! 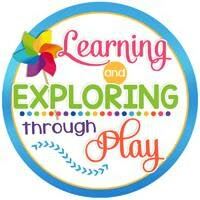 Our blog is Learning and Exploring Through Play – come over and see all the fun and mischief we get up to! 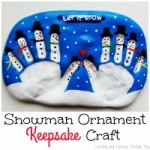 Today we are sharing a different craft with you, a new one completely for us! 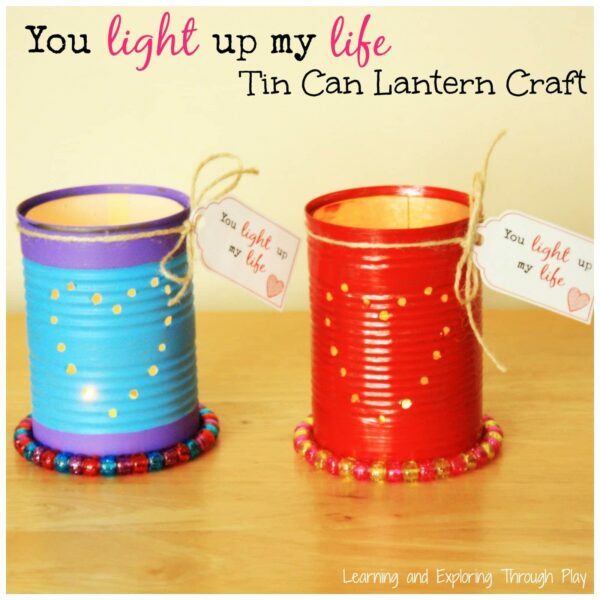 Heart Tin Can Luminaries or Tin Can Lanterns! 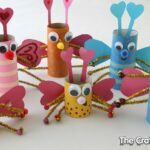 So many of you are enjoying crafts that involve recycling these days and we wanted to share with you a craft that is not only great fun to make but also effective and cheap as chips! Battery Operated Tea Light Candles (here for US readers) though as these are tin cans, you can also use real candles relatively safely! 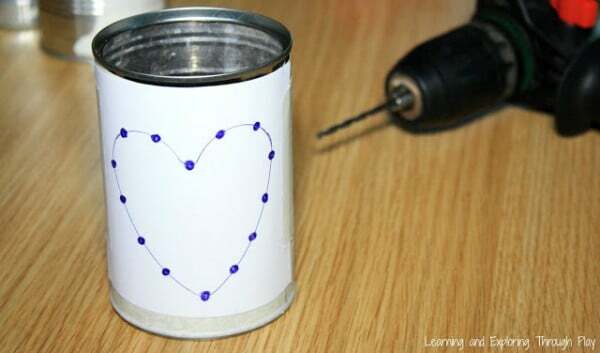 ALTERNATIVE Tin Can Lantern METHOD: *Deburring tools are surprisingly inexpensive! If you don’t want to get one.. a hammer and nail can do the trick too.. BUT this is a slightly trickier method and we find that it depends on the tin can and how sturdy it is as to how easy or hard the craft becomes. Some tin cans are super easy to pierce, others buckle. If they buckle, you can fill the tin can with water, pop in the freezer and try again with frozen ice in the centre to “support” the can whilst piercing! 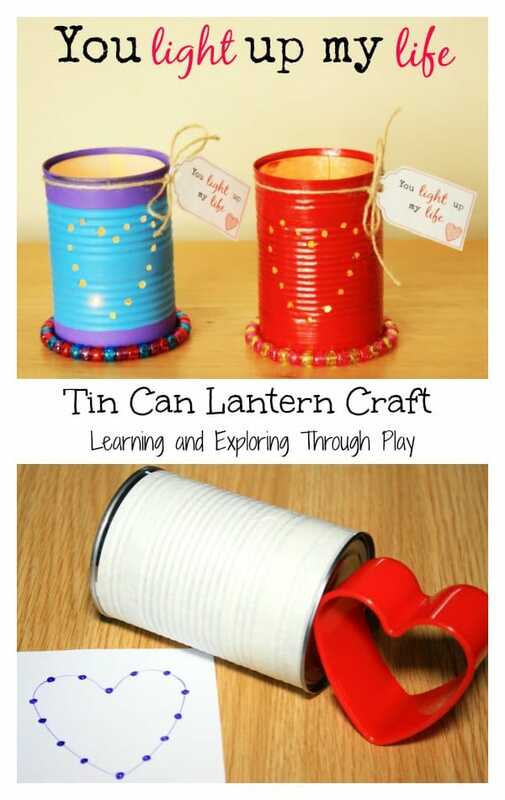 Start your Tin Can Lantern Craft, with washing out your tin cans. Once you have a set of cans washed out – you are ready to start! Cover the front of your tin cans in masking tape. We found that without this tape the drill kept slipping. The masking tape created the sturdy base we needed to create effective holes in the tin can. Next draw a heart template. I used some cookie cutters I have just ordered, to draw around. I also added where I wanted the holes to be. This meant I could make sure the holes were roughly an equal distance apart, rather than doing them free hand with the drill. 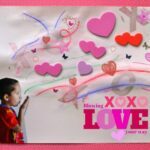 Stick your heart template on top of your masking tape. You can now start drilling your holes through. 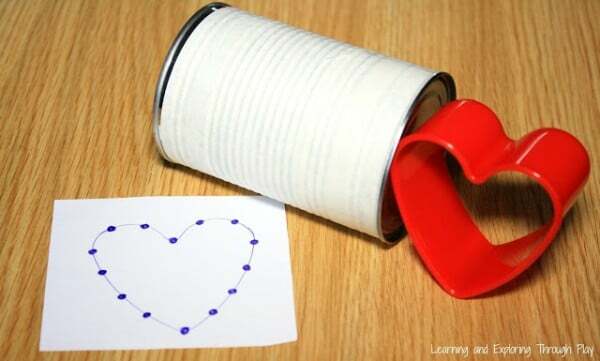 Remove the masking tape and you should be left with a lovely heart shape on the front of your tin. Check your tin isn’t left with any sharp edges once you have created your holes. We did use a Deburring Tool to help create even smoother edges, if you have one of these tools handy then here’s the craft to use it with! Now for the fun part! Start painting and decorating your tins. We used Acrylic Paints and found they worked great! I always use Reeves Acrylic Paint and highly recommend it! Such small amounts go a long way and the colours are so vibrant and great when mixed too! 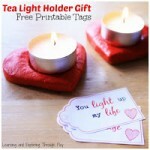 Once the tins were all dry I had some twine string that I tied around the top and attached a cute tag reading ‘You light up my life!’ You can download this tag FREE from our blog. 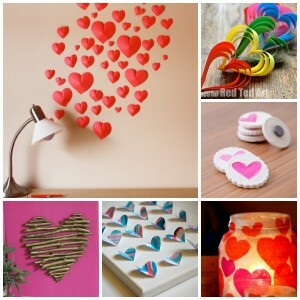 These heart tins make cute decorations for around the home – all year round but in particular for Valentines Day. 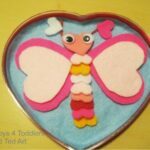 Older children can help drill the holes and the younger children can help to decorate them with paints, glitter, sequins, gems! A craft for all the family to get involved in! Add your tags and why not send them to friends and family! They will love that they have been thought of! 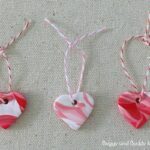 You can also use the tags on these cute Thumb Print Candle Holders Keepsakes. 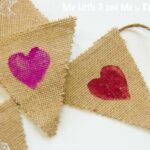 I hope you enjoyed our craft, why not stop by our Facebook page and share with us the Valentines activities you have been doing with your children? We love seeing what you have all been up to!